1. A foolish, unreasoning, or extravagant passion or attraction. See Synonyms at love. 2. An object of extravagant, short-lived passion. I decided to go with the idea of infatuation in term of "short-lived passion"
The subject is a common girl dressed in high school student. I pick the subject to represent stereotype of teenagers during that certain period. Teenagers filled with short lived passion towards their obsession. Therefore I decided to show this motion in simplified geometrical abstraction. Arrows was also used to emphasized the movement . I used the butterflies (rather hidden) because of the short lives they have (3days on average), it kinda represents temporary thing for me. I try to keep as simple as possible (for SIMPLEISM) but then again I got carried away. No words to describe... The vector works is wonderful, great skills there :bows: And the background is just simply stylish :clap: Probably one of my favorite works for you. Oooh, it was the one I though it was ^^ . Love the vectoring and the background, although subtle, does the vector justice and provides a good base for the cleanliness of the character to shine :) . Good luck with the WAR comp! OMG..the vector is super well done. The coloring is so soft and pretty. I keep wondering to myself why the long, drawn out explanations of vocabulary that I see on Minitokyo; then I remember that the great majority of people on the internet are idiots, and things fall into place. A nicely done vector background—simple as is your usual style with vectors. Simple and well executed, very clean cut: which is something that you don't see with many Minitokyo products. Great work. Hi Caliqos! How have you been? I see you make a new wallie. Its very nicely done sepically the girl. However just her leg.... >_< Sorry bout it! I find her leg kinda too big. X.X If you make it thinner it would looks better. Anyway a very nice wallie indeed. Keep it up! this is very "clean" !! I love vectors, and I know why when I see yours... it is really beatifull. I love the girl (school wear... >_< ). nice and simple does it ;) vector perferct and so is that background...i think this is great! very nice vector. very nice. i really dig the background. it is simple and mellow, very subdued. great job. keep it real real, nice vector. wow cal-san ~ u did a very beautiful job on the vector . its really really hard to vector range but u did it pretty good . and such a cute bg u made too. the bubbles rso cute . so r the arrows. n the round round font is so pretty. Why you change the title...lol...I like this one better than the rough draft version of it...I have no clue how you have done the grunge...because I am not an artist of it...but I like the grunge for this one...much smooth rather than hard edges...and the concept of bubbles never hurt anyway...and I have a feeling that you ran out of time fix something else...I think you really kept it simple...I am the chaoticism...it is simple and clean...the vector of course is really nice..lol...I wish I could do it but my first attempt knock the fruit out of me already...but I will try it some more someday and make wall out of it...I can't be random...so grunge is not my thing...but good luck on the contest...!! At first, it didn't feel like infatuation to me, but then I read your description and it really made some sense to the theme. Your vectoring is really pretty and has a nice soft quality to it. The colors are my fav and I love the theme of the bg. Words that appear slightly and the bubbles that show that each infatuation is as delicate as a bubble for the average school girl. Really awesome work! Was the scan vectored too? Really impressive. Nice blending between shades. A sort of painted look to it. Personally, I feel the background looks a bit too...how to say...bubbly? Like, happy go lucky. Doesn't seem to quite relate to the word infatuation in my mind. But it's all about interpretation I guess. All your reasons make sense. awesome metaphors you have here: the butterflies and the the blue bg. this is an excellent vector.. i just have one minor complaint perhaps having just a little more in the bg and moving the title to the bottom would have been a tad more effective. very good job, calisqo. i am envious of your vectoring skills. 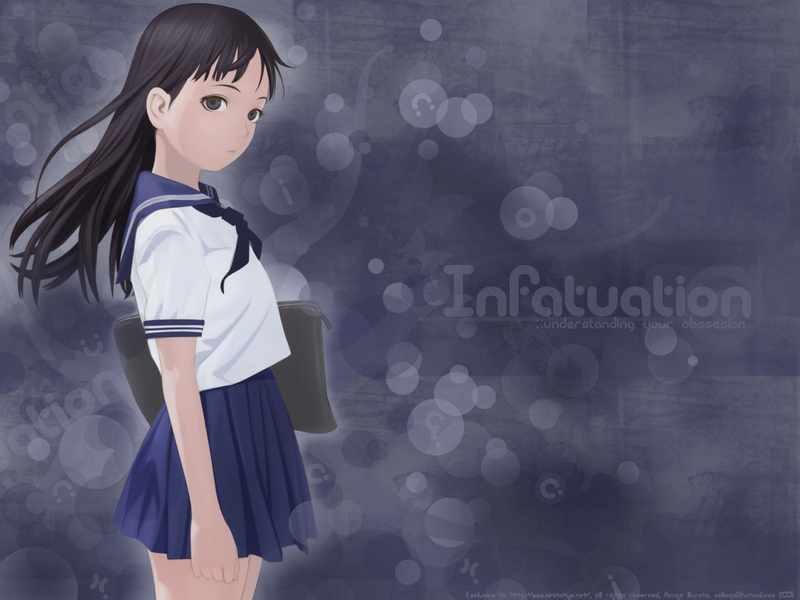 Your wall ould also stand for the seemingly odd infatuation some people have with schoolgirls XD . Anyway, your wall is very soft on the eye and very flowing with the placement and design of circles you have used. The other odd shapes, arrows, and swirls you have used give much movement to the wall and focus the eye onto the character you've chosen well. Your vector job is superb :nya: . Very simple, yet elegant your entire wall is in design. Lots of icon space is also included in your wall, which will make those wanting icons very happy. The text you chose also fits perfectly in the way that it too is very rounded. I also noticed a sort of glow around the girl which really helps her to stand apart from the sea of blue, yet blends in with the rest of the wall. Great wall from the Simple-ism team :D .
I agree it's so soft for the eyes ... this color theme. Nice choice of scan also. Your explication looks fine to me. I love your grunge texture :) I would like to see more contrast in it but then maybe it wouldn't look simpleism anymore. I like the tranparents circles on the girl, should have more of them I think... on her hair especially. your wallp is very cute... but your descript is cool.. :D awesome!